This is an experimental approach today with favorite ingredients. Preheat oven to 380 degrees. Cut potatoes and red peppers, toss with 2 T olive oil, then spread out evenly on roasting pan. (The secret to successful roasting is to cut pieces into equal size pieces and turn them occasionally while roasting so they all cook evenly, none dry out.) Roast for 10 minutes, then turn peppers and potatoes. Continue roasting for another 10 minutes. Remove peppers, check potatoes-they may need another 5-10 minutes until are lightly browned and fully cooked but not mushy and falling apart. Reduce heat to 350 degrees. Rub 1 T olive oil over bottom and sides of 9×9 inch baking pan or 2 quart baking dish. Chop roasted red peppers into large bite size pieces. 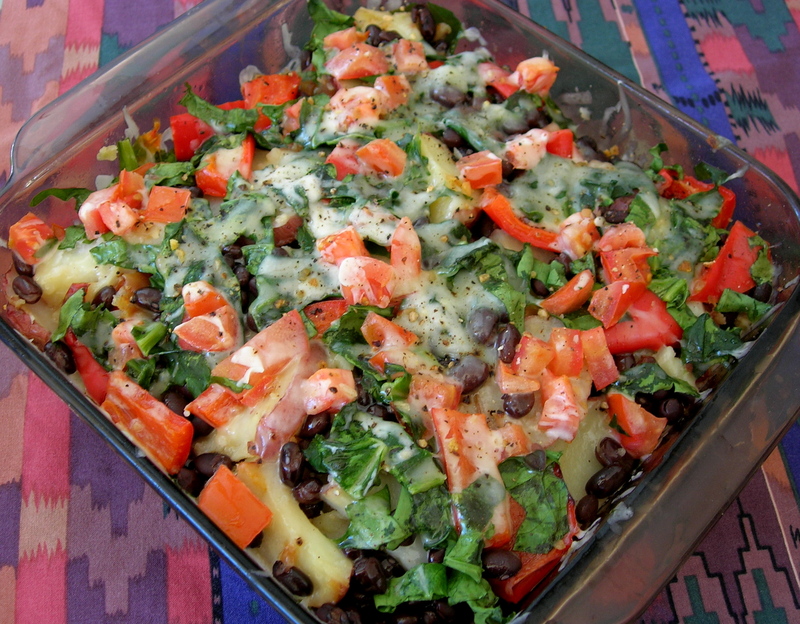 Using half of each ingredient to create casserole with two tiers, layer potatoes on bottom, sprinkle diced roasted garlic over potatoes, cover with well rinsed and drained black beans, red peppers, spinach, tomatoes, cheese; repeat with remaining potatoes, garlic, black beans, red peppers, spinach, tomatoes, cheese. Add 2-3 T water into corners of dish, cover with lid or foil, cook covered for 10-15 minutes, then 5 minutes uncovered until spinach is cooked and cheese melted and lightly browned. Thank you, Lois, for introducing me to Frank’s Red Hot original cayenne pepper sauce. Yes, just right for this. A note about protein: this recipe will be light on protein for dinner. Assuming this makes 4 servings, at 1 oz of cheese, 1/4 can of black beans, plus some spinach per serving, it has only about 6+2=8 grams of protein per serving. So next time I’ll also add a can of well rinsed and drained garbanzo or kidney beans to increase the amount of protein. A healthy active female needs 50 grams of protein on average every day to maintain good health, a balanced metabolism, strong energy, sharp mind, and beautiful hair. This entry was posted in Breakfast, Entrees and tagged Beans, Greens, potatoes by Jill. Bookmark the permalink.